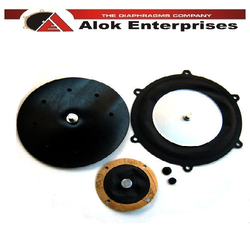 Prominent & Leading Exporter from New Delhi, we offer voltran diaphragms (suitable for). We specialize in manufacturing and supplying Voltran Diaphragms. Our product is manufactured using high quality rubber with the support of innovative technology. Owing to their durability, our products are widely used in the gas industry. In addition, our range of products is used in various industrial applications in different enclosures. Looking for Voltran Diaphragm Repair Kit ?